My son Ben one day said “I feel sorry for Dori”. His baby brother Dorian has a terminal illness. He depends on a multitude of machinery to help him breathe that keep him tethered in place. He can’t walk. He can’t crawl. He can’t sit up on his own. He’s (almost!) 10 years old and is the size of a small toddler. Dorian’s twin brother, Wynn, passed away when he was 6 years old from Mucolipidosis II (the disorder they both share). But as soon as Ben said he pitied Dori, my husband interjected, “There’s no need to feel sorry for Dori. 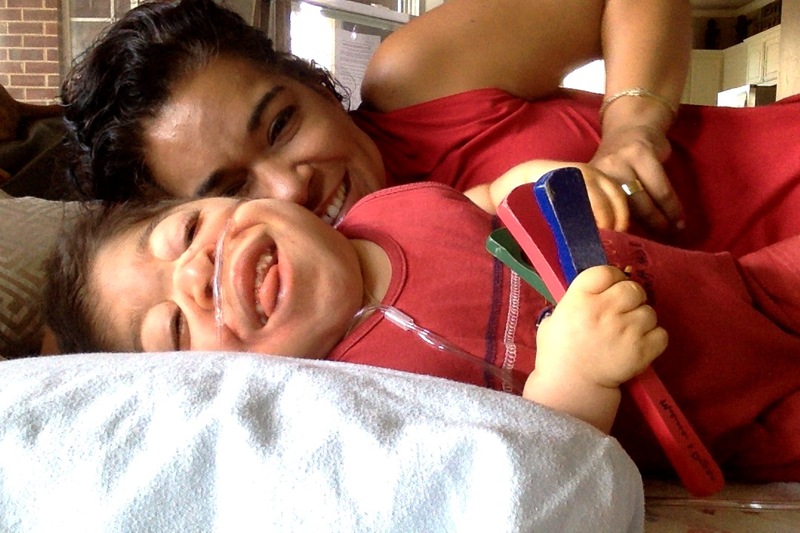 He’s the happiest most loved stinker on the planet.” Dorian is happy, he thrives on making people laugh, he loves asking for “snuggle time” and he rhythmically uses his tummy as a drum while he jams to his favorite music all day long. He says “I love you!” more than anyone else I’ve ever known and he is truly a blessing to our family. We don’t feel sorry for Dori because we know he loves his life and he is deeply loved by many. At first I thought it was harsh that my husband told our son to not feel sorry for Dori, but we know that Dori is living out his destiny as God intended. Who are we to think his life is any less joyful or any less fulfilling measured by our standards of joy? This video reminds me of that conversation by Claire Wineland. She says “we look at people who are sick and we pity them, because we believe that their sickness makes their lives inherently less joyous than everyone else’s.” She proudly declares some of her happiest days have been while sick in the hospital because joy and beauty are all around her, despite her battle with cystic fibrosis. She goes on to say “I’ve been sick and dying my entire life, and yet I am so proud of my life.” She reminds us that we are all guilty of waiting to be healthy, or wealthy or wise — and yet in that time we are waiting for things to be perfect we miss out on all the perfect joy and fulfillment in the world around us. Sadly Claire passed away last week in the process of getting a lung transplant, but her courageous journey and her passionate mission will live on within those she inspired. I’m proud that our son Dorian has Claire’s zest for life and that our other sons have grown to appreciate his journey just as it is. You may have a loved one, a friend or a co-worker that is going through a health crisis of their own. Lend them your empathy, offer them your support and give them your love. They’d much rather enjoy that than your pity. With your heart having the best intentions, your positive influence can help them experience all that joy hidden around them while everyone else is busy feeling sorry for them. Give them a reason to laugh for laughter is proven to be some of the best medicine around.